WASHINGTON — The United States will meet President Barack Obama’s goal of admitting 10,000 Syrian refugees into the country on Monday, the White House announced. Obama sought a sixfold increase in the number of Syrian refugees provided safe haven in the United States. After a slow start, the administration was able to hit the goal about a month early and just a few weeks before Obama convenes a summit on refugees during the 71st session of the United Nations General Assembly. Obama would have been hard-pressed to make the case for other countries to do more with the U.S. failing to reach a goal that amounts to only about 2 percent of the 480,000 Syrian refugees in need of resettlement. Millions more Syrians have fled to neighboring states such as Jordan, Turkey, Lebanon and to countries in Europe since the civil war broke out in 2011. “On behalf of the president and his administration, I extend the warmest of welcomes to each and every one of our Syrian arrivals, as well as the many other refugees resettled this year from all over the world,” National Security Adviser Susan Rice said in a statement. Rice said the summit in New York City will highlight the contributions the U.S. and other nations have made to help refugees. She said the U.S. has committed to working with the international community to increase funding for humanitarian assistance and double the number of refugees afforded the opportunity to resettle. “Together, we can build a more sustainable and responsive humanitarian system capable of meeting today’s unprecedented global humanitarian challenges,” Rice said. The increase in Syrian refugees also comes at a time of heightened national security concerns following extremist attacks in the U.S. and abroad. 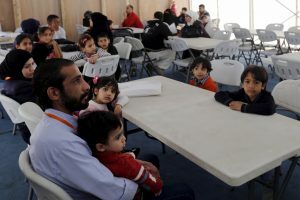 The Obama administration has said that refugees fleeing war and persecution are the most scrutinized of all immigrants who come into the United States. The process typically takes 12 months to 18 months and includes in-person interviews and a review of biographical and biometric information. Officers with the United States Citizenship and Immigration Services travel to the country where the refugees fled of interview them. Upon completion of security and medical screening, the Homeland Security officer may approve the refugee’s application for U.S. resettlement. After approval, arrangements are made to match the refugee with a voluntary agency in the U.S. that specializes in helping them find a new home and employment.